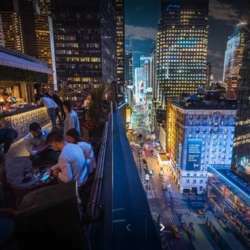 Join us at the Dream Hotel- Midtown, PhD terrace to celebrate Spring, International Dance Day, fabulous views, and the most interesting international crowd NYC offers. There will be drink specials and ice-breakers. Guests are welcome to stay after our event. 1. BASIC LEVEL MEMBERS & GUESTS MUST PAY AHEAD OF TIME, or regretfully we will have to turn you away. No sales at the door. We have priced to split the fees. 2. Coat check is downstairs, lobby level, near where you get your id checked, and your event bracelet. 3. There are drink specials and food available for purchase all evening. 5. This event is 21+, so bring your valid id (drivers license or passport). 6. No shows are no fun. If your plans have changed, please update your RSVP to the event. 7. Dress is business casual to elegant; no ripped jeans and similar. 8. This venue is ADA compliant and accessible.